I hope you all had a fabulous weekend with lots of vintage fun! I start each week with my Weekly Vintage Attire blog, where I’ll be featuring all the glamorous outfits I wore last week, where I sourced them from, and a little on what I’ve been up to! I often get asked to share more photos of what I wear, and how I style my daily outfits so I’ve really focused on creating more of these photos, and also videos too. I do hope you in enjoy this fabulous post and maybe even get a little glamorous inspiration! With a busy weekend passed I enjoyed a lovely day off on Monday, returning to a busy week starting for me on Tuesday, casual glamour-wear was a must to get through all I had to do. Blouse: Anglicare Morley, my favourite op shop. Earrings: Polka Dot Vintage Markets, their next event is on August 13th and 14th! Brooch: from Bettina Darling, it’s a cute western brooch from 1944! Wednesday I was feeling the cherry love with meetings and other fun to be had. I’m working on so many exciting projects some of which I’m yet to announce! Blouse: A gift from my partner’s grandmother. Necklace, belt, skirt, and head tie: Cherri Lane. I was also thrilled as a beautiful bag I’ll be reviewing from Lola Von Rose arrived, I can’t wait to share how much I love it in future blogs and videos! Thursday was a truly beautiful day, myself and a few other beautiful members of The Perth Pinup Community went along to RUAH’s homeless centre to host a BBQ for the homeless. It was a truly inspiring and humbling day. We were lucky to meet Dug pictured below with us, who shared his story of once homeless and now has a house, and runs his own business, and how RUAH has helped him so. Brooch: The Perth Pinup Community’s custom brooch from Deer Arrow. On Friday I had a fabulous day of working from home again, I wore my most glamorous loungewear. I styled my hair in a beautiful gibson roll which I’ll soon be making a tutorial for! I do enjoy dressing up even on days where I’m not going out, it makes me feel beautiful, and is like a uniform to keep me focused on my work. Dressing gown: Secrets in Lace. Loungewear gown: a vintage piece. Saturday was a lovely day with lots of work in the morning, and a very social afternoon and evening. We had our’s cousin’s second birthday party, a dinner out, followed by a 40th birthday celebration! Headband: Kelly The Bow Lady. On Sunday The Perth Pinup Community got together with a few of our members to volunteer at the Possum Valley Animal Sanctuary where we had so much fun! It was a lot of hard work cleaning up animal enclosures but it was so rewarding. We loved meeting all the animals and having a delicious potluck lunch! It was truly beautiful week, that was inspiring and humbling. I can’t wait for all I have planned this coming week! Be sure to stay tuned as I have more vintage fun coming real soon! 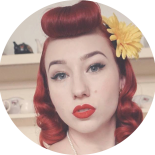 This entry was posted on August 9, 2016 by Miss Lady Lace in Weekly Vintage Attire and tagged 1940's, 1950's, blogger, glamour, miss lady lace, miss lady laces pinup blog, perth burlesque, perth pinup, perth pinup blog, perth pinup community, pin up, pinup, pinup blog, pinup blogger, pinup fashion, pinup girl, pinup life, pinup lifestyle, pinup perth, red lips, retro blog, retro girl, retro glamour, the perth pinup community, victory rolls, vintage, vintage blog, vintage blogger, vintage fashion, vintage girl, vintage glamour, vintage perth, vintage pinup blog.